Fujitsu Limited and Microsoft Corporation today announced their agreement to collaborate in the field of artificial intelligence to accelerate the transformation of the ways people work in companies. The two companies are entering into this agreement to jointly build new solutions that transform the ways people work. Based on Microsoft 365(1) , Microsoft's integrated cloud service, these new solutions will combine the insights and experience Fujitsu has accumulated through the internal and external deployments of its Global Communication Platform, together with Fujitsu's AI technology, Fujitsu Human Centric AI Zinrai, and Microsoft AI platform services on Microsoft Azure. They aim to make these new solutions available in the Japanese market from the second quarter of 2018 (April to June), and then to roll them out globally thereafter. Since entering a global alliance in the field of corporate solutions in 2002, Fujitsu and Microsoft have expanded the scope of collaboration in line with a changing market, including in such areas as the cloud and IoT for manufacturing. Since 2015, the two companies have been building a strong collaboration in the field of work-style transformation, with Fujitsu, through technical assistance from Microsoft, deploying a globally unified communications platform based on Office 365 for its approximately 160,000 employees. It then began using the knowledge and experience gained from that internal deployment to make its Global Communications Platform available to about 1.5 million customers in Japan. Now, as the movement to increase productivity using rapidly advancing digital technology gains traction globally, Fujitsu and Microsoft have agreed to further expand the framework of their collaboration, jointly building and launching solutions that further transform the ways people work by using the two companies' services and AI technologies. Fujitsu and Microsoft will jointly build new solutions that further transform the ways people work by combining a myriad of big data accumulated by companies, including Microsoft 365 data on Microsoft Graph(2) , with services such as Human Centric AI Zinrai, Fujitsu's AI technology, as well as Microsoft AI platform services on Microsoft Azure, and Microsoft 365. Moreover, the two companies will conduct internal trials of the jointly built solutions in several countries, accumulating knowledge and experience to enhance quality and deployment. The solutions will then be made available in the Japanese market beginning between April and June 2018 through Fujitsu Cloud Service K5 and Microsoft Azure. They will then be rolled out globally. Big data generated through use of Microsoft 365 is aggregated through Microsoft Graph, and Microsoft MyAnalytics and Microsoft Workplace Analytics(3) , etc. visualize the usage status of email and calendars, which had in the past lacked visibility. Zinrai AI technology distinguishes the importance and priority of tasks mentioned in the body of an email, and encourages users to perform important tasks. This helps users quickly handle high priority tasks, enabling them to focus on creative work, such as idea generation, which can lead to higher added value. Automation and streamlining of tasks is achieved by combining Microsoft Cognitive Services and Microsoft Azure Bot Service with Fujitsu's conversational AI technology and the Zinrai natural language analysis API, offering a more human-centric user experience. For example, in setting up a meeting, the conversational AI technology is able to search for an open timeslot shared among the participants, and list up candidate dates and times, meeting formats, and venues in consideration of participants' convenience. Using the connections among people or things is considered an effective way to find exceptional human resources or valuable documents within organizations. To this end, Knowledge Graph(4) is used as a base of knowledge that expresses in graph form the relationships among people or things. Furthermore, when the characteristics of such relationships are analyzed by Zinrai AI technology, and this is applied to Knowledge Graph, it becomes possible to discover outstanding human resources and meaningful documents, offering the ability to effectively utilize information, such as in selecting the most suitable team members when launching a project. Users of Microsoft MyAnalytics and Workplace Analytics etc. can visualize the ways both individuals and teams work. Moreover, by combining and benchmarking Knowledge Graph and Fujitsu Laboratories-developed Deep Tensor®(5) machine learning technology, which enables highly accurate analysis of graph-structured data, these solutions can provide insight into how high-performance individuals, organizations and companies are working. It can also enable an understanding of the important factors behind such performance, and lead to true transformation of the way people work. 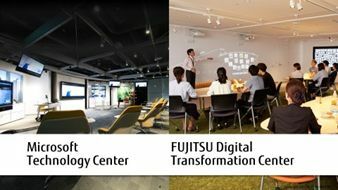 In order to expand sales of the jointly built solutions, the two companies will not only be offering consulting services aimed at deployment, but are also considering to run experience courses, to be held at the Fujitsu Digital Transformation Center located in Minato-ku, Tokyo, Fujitsu's co-creation workshop space aimed at achieving digital transformation, and the Microsoft Technology Center located in Minato-ku, Tokyo, a facility where visitors can experience Microsoft's latest technologies. The two companies will also be jointly working at new customer development, primarily of existing users of Office 365 and Microsoft 365, and aim to develop a new 2 billion US dollars of new business in the global market by 2020. As AI's presence in customer workplaces has grown, Fujitsu has been working to increase the wellbeing of people through technology, as part of our concept of "Human Centric AI". This collaboration with Microsoft in AI will bring our relationship into a new phase, and I believe it demonstrates the fruits of digital co-creation. In order to create a prosperous future, we will work with Microsoft to generate new innovation. "Expanding our collaboration with Fujitsu provides customers with yet another way to take advantage of the powerful and intelligent digital capabilities of our platform to drive more collaboration and creativity," said Judson Althoff, executive vice president of Worldwide Commercial Business at Microsoft. "Through integrations across our productivity suite and Fujitsu's unique industry expertise, customers will have more tools to create and collaborate."